Yaskawa Electric Corporation (head office: Kitakyushu city, Fukuoka Prefecture: Representative Director and President: Hiroshi Ogasawara) proposed an innovative concept of “unmanned factory” back in the 1970s, where digitally controlled and digitally connected machines are working systematically. Yaskawa named the concept “Mechatronics”. Since then, Yaskawa has been offering an array of automation solutions (*1) that includes AC servos, AC drives, and robots for improved productivity and for high quality standards. Yaskawa will realize enhanced productivity and higher quality through data acquisition and analysis by means of Artificial Intelligence. It will offer real-time visualization of manufacturing statuses, link and conveyance between devices, and reduction of tact times by leveraging big data for improved productivity. As to securing and maintaining high quality, it will also utilize analytics on data pertaining to product quality to improve standards of accuracy by equalizing inspection procedures. What Yaskawa is about to offer anew are solutions that merge software with hardware, and it will create new value for its customers. 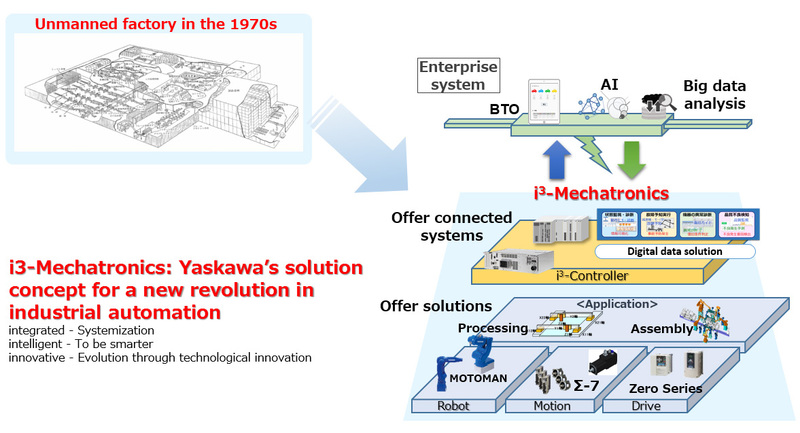 (*1) In the latter half of the 1960s, Yaskawa Electric proposed the concept of mechatronics, as the innovative idea to combine customer’s machinery and Yaskawa’s electric products to achieve higher performance. (*2) Yaskawa Electric obtained a trademark registration for “i³-Mechatronics” in June 2014.